Thanks to Singapore Home Cooks and Dancing Chef for the collaboration with Mummy’s Kitchen. This collaboration has given us a challenging opportunity to create a traditional dish with a twist. This one of its kind dish made its way to our dining table a few nights ago (17 July 2017) and I hope that it will make it to your table soon!! My family felt that this was more flavourful (no need for a chilli sauce to go with it) compared to the traditional Roast Pork and rest assured that the crunch is not compromised!! We certainly hope that for anyone who recreate this dish in their home or eatery will credit this dish back to Mummy’s Kitchen at Beyond Norm Blog. If you like this recipe, be generous and give us some feedback/comments via our blog. We would also like to welcome you to join our Mummy’s Kitchen Facebook Group for food lovers like you, whether newbie or veteran. You can like us on Beyond Norm’s Facebook Page and subscribe to our blog. Follow us on Instagram and YouTube @beyondnormblog to get the latest updates and videos. Rub 2 tablespoons of salt to the pork belly to get rid of the pork smell. Leave it for 10 minutes and then rinse off with water. Pat dry with paper towels. Make sure the whole slab is DRY. Turn the slap skin down and make 2 or 3 slices across the belly meat, deep enough for you to rub the marinade into it, but don’t cut through to the fats. Use 80g of the laksa paste and rub it all over the meat portion only (including the in between of the belly meat). Clean off any laksa paste that is on the skin with a paper towel. 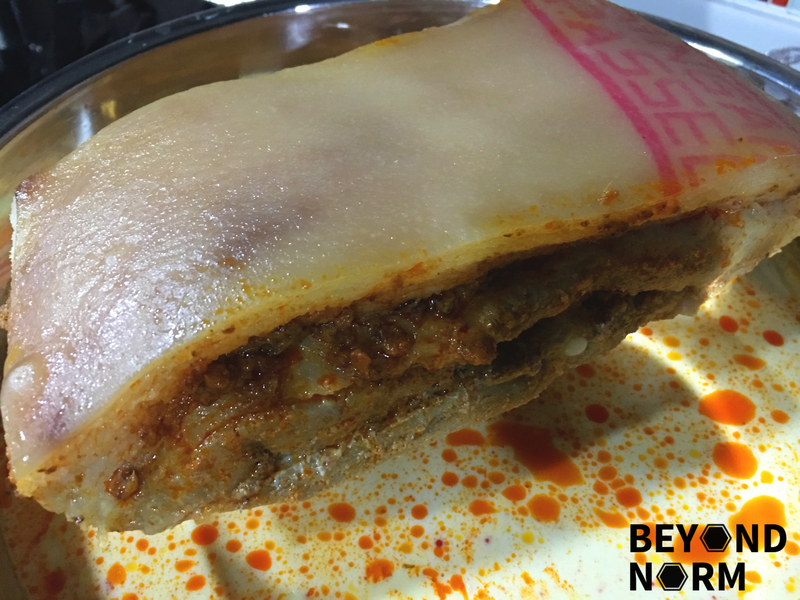 Leave the pork skin side up and uncovered in the fridge for at least 6 hours or preferably overnight. Remove from fridge just before cooking. 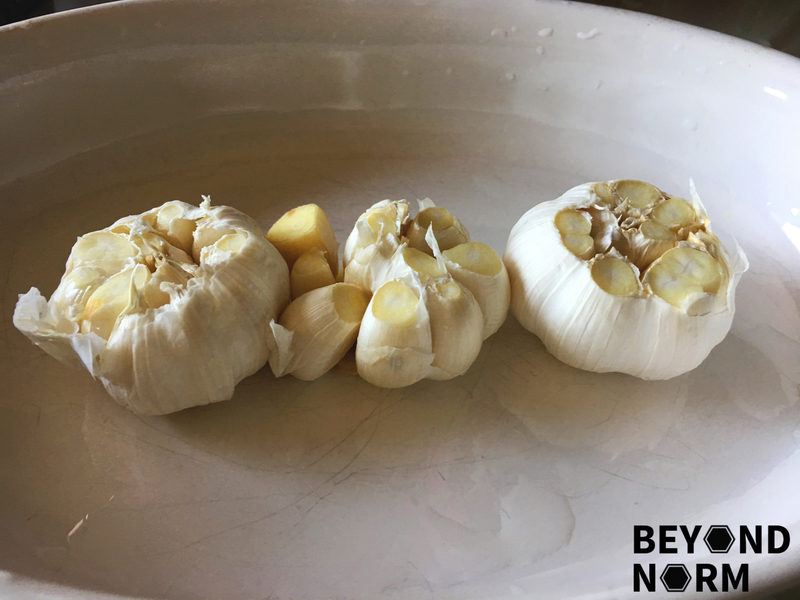 Slice a ¼ off the top of the bulbs of garlic and place them in the baking tray. Then pour in the milk and white wine. (I used milk only). Place the pork on top of the bulbs of garlic. Make sure the skin does not touch the liquid. The belly flesh, however, may be immersed/in contact with the liquid at this point and this is alright. 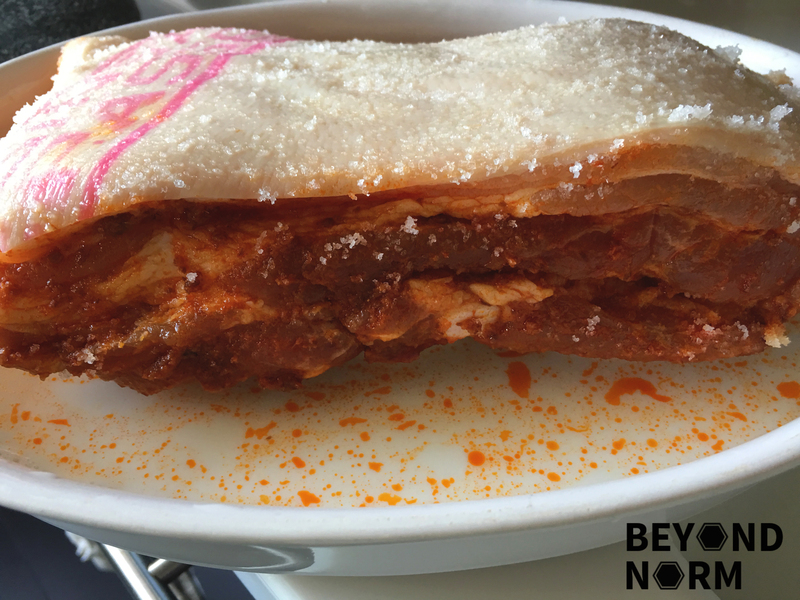 Cover the baking tray with aluminium foil, making sure the tray is tight but doesn’t touch the skin of the pork. Otherwise, salt won’t dissolve and will form a salt crust instead of crackling. Take it out of the oven and transfer the slab of pork belly to a cooling tray. Leave it to rest for 15 minutes before carving.